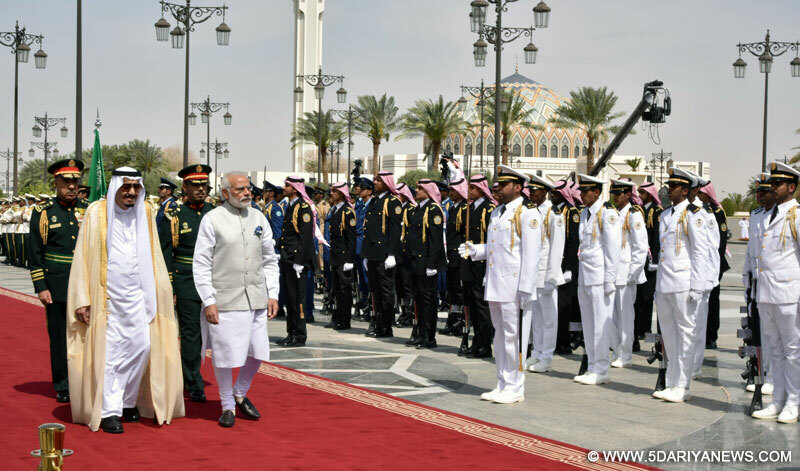 The Prime Minister, Shri Narendra Modi being received at the Official Welcome ceremony at the Royal Court, in Riyadh, Saudi Arabia on April 03, 2016. Prime Minister Narendra Modi was on Sunday, the second and final day of his bilateral visit to Saudi Arabia, accorded an official welcome by King Salman Bin Abdulaziz Al Saud.King Salman received Modi and his delegation at the Royal Court here.The Saudi monarch is hosting a lunch in honour of the visiting prime minister.This will be followed by delegation-level talks and signing of agreements between the two sides.Fighting terrorism, energy cooperation and trade and investment are high on the agenda in Sunday's talks.Apart from being India's largest crude oil supplier, accounting for one-fifth of the imports, Saudi Arabia is also India's fourth largest trading partner with bilateral trade reaching $40 billion. There are nearly three million Indians in Saudi Arabia, a large number of whom are blue collar workers involved in the Gulf kingdom's various infrastructure projects.Earlier on Sunday, Modi visited the Tata Consultancy Services' (TCS) all-women IT centre here and then addressed the Saudi Chambers of Commerce.Saudi Arabia is the third and last leg of Modi's five-day, three-nation foreign tour which also took him to Brussels and Washington, D.C. In Brussels, he attended the 13th India-European Union (EU) Summit and held a bilateral meeting with Belgian Prime Minister Charles Michel, and then in Washington he participated in the Nuclear Security Summit hosted by US President Barack Obama. This is the first prime ministerial visit from India to the oil-rich Gulf kingdom since the visit of Manmohan Singh in 2010.Modi leave will leave for New Delhi on Sunday evening.